I quite honestly did not know what to think of this movie going into it. And I must admit that my first impressions of the movie were not good. However, there is something quite captivating about it, and my interest was kept until the true stars appeared. These true stars being Romeo and Juliet played by Leonardo DiCaprio and Claire Danes, respectively. More about them in a minute. First let me say that this movie had a lot going for it to begin with. The script, by William Shakespeare, is a timeless classic that has been adored by generation upon generation. However, it has also been done many times. So why should this rendition be any different? The answer is because although the script was adhered to strictly, nothing else was. The makers of this movie simply escaped all boundaries setting the story in modern day and giving handguns brandnames such as dagger, longsword, or rapier. At first, this movie seems to be a horrible disappointment. The opening scene is shot in a disturbing manner such that we are never able to get a real feel for what is going on as observers. However, looking back, one can see the wonderful uniqueness of this scene and the directors attitude toward violence: that it is simply immature and silly. However, with such a unique directing style and set, this movie did not seem to prove anything. 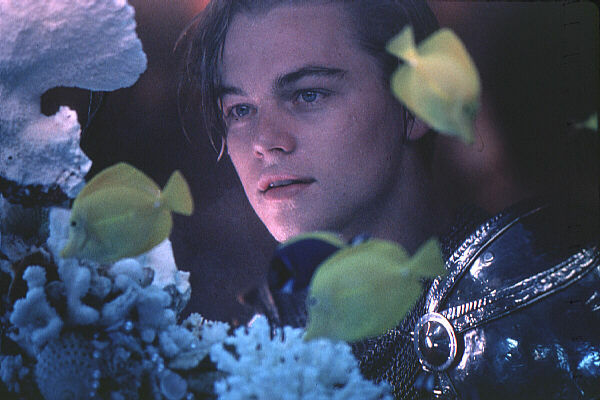 That is, until Romeo and Juliet first appear. Their first meeting is simply captivating. These two young actors turned in probably the two greatest performances that I have ever seen on screen. Enough cannot be said about the ease in which they delivered their lines and made them truly believable. But more importantly was the chemistry that these two had with each other. It is hard to recall a love so evident and so true in any movie of recent memory. DiCaprio and Danes put everything into making their characters come to life. Their body language, in addition to their Shakespearean language, really helped to tell this story and to capture the audiences heart. Strong performances also came from the tattooed priest (Pete Psotlethwaite) and the exuberant nurse (Miriam Margoyles). They were both truly enjoyable. One other strong note of this movie is the notes themselves: the music. This soundtrack features many new songs and the score is quite swaying. This is the most pleasantly surprising movie of the year. It is a movie which will be remembered for years to come by those who have seen it not only for its uniqueness but also for its passionate performances from DiCaprio and Danes. How would you rate the movie Romeo and Juliet? There have been 32777 people to visit this page since Mon, Dec 16, 1996. And you are the first person to visit this page today!